The “Training for Museum Curators in Charge of Conservation” training program has been held every year since 1984, with the aim of imparting basic know-how and skills to curators responsible for conservation work. This year’s training program was held over a two-week period starting on July 13, 2015, with 32 participants from all over Japan. The curriculum for this year’s training program focused on two key areas: facility environmental management (including temperature and humidity, air circulation, and prevention of biological damage, etc. ), and the factors behind, and forms taken by, deterioration of different types of materials. Experts from the Institute’s staff, as well as external experts, gave lectures and led practical, hands-on training sessions. The Museum of the Sakitama Ancient Burial Mounds (in Saitama Prefecture) kindly made available its facilities for the implementation of a hands-on museum environment survey case study, in which the training program participants were divided into teams of eight trainees each to undertake surveys focusing on different themes; the trainees subsequently gave presentations on the results obtained in these surveys. This year marked the 32nd year that the “Training for Museum Curators in Charge of Conservation” training program had been held; a whole new generation of curators is now receiving training. 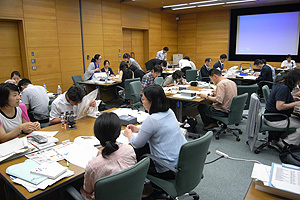 Today, many of Japan’s public museums in particular have reached an age when they need to undergo renovation or renewal of their facilities; the Institute will be working to strengthen the provision of this type of training program in the future, with the aim of ensuring that know-how relating to both the theory and practical methods of materials conservation can be handed down to a new generation of curators.